Gail is a fantastic friend. 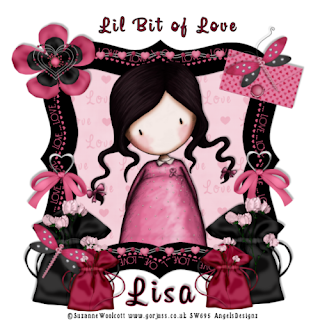 Please check out her lovely site. I was fiddling around again lol. If this lil lot is any use to you feel free to grab it. It's all in seperate pieces so you can fiddle around & add bits etc. There's..... 3 baubles, 3 Flowers, 2 Bows & a Wreath. 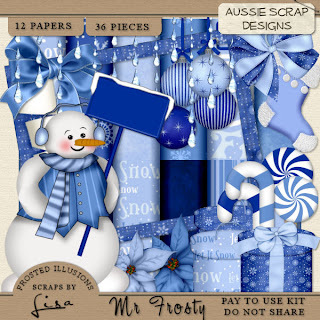 New PTU Kit "Purplelicious Xmas"
This kit is heaving with 60 Elements & 16 papers. It comes in both Full Size & tagger Size & is available in my stores now. Not all items are shown in the preview, a full listing is available at the stores. 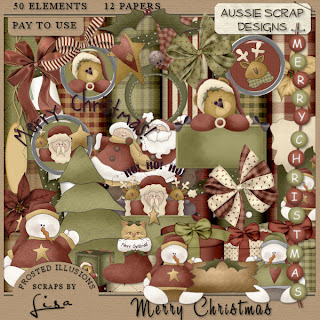 New PTU Kit " A Merry Christmas"
New pay to use kit called "A Merry Christmas" This kit is available in both Tagger & Full size & If you buy it before Sunday over at Aussie Scraps, it will cost you just $2.00 usd. After Sunday its back to normal price. So quick get over there if you want a bargain. Wow i had a totally weird experience the other day!!! Anyone ever been to a palm reader, fortune teller that kinda thing?. Well whenever anyone said palm reader to me, i always thought of a lil gypsy lady, head scarf & big hooped earings staring into a crystal ball lol. Well let me tell you my whole opinion has changed dramaticly lol. I was at a party and this lady was sat in the corner reading palms. So me being the big i am says " Yeah yeah i'll go and see her the min she starts chatting rubbish i'll laugh in her face" So off i trot over to where she is sitting, held out my hand to say hello & before i could get my back side on the chair she says "Who's Grant? someone just shouted Grant in my ear" So i gave her the best blank look i possibly could & she proceeded to tell me that me & Grant were very close & shared at lot of love. Grant is infact my brother lol. She then went on to tell me personal stuff about myself, that i have only ever shared those people very closest to me. By now i'm feeling slightly freaked out, but still i am not agreeing or responding to anything she is telling me. Just to put the cherry on the cake, she sat stroking my life line, saying it was very long. Then proceeded to tell me about my "stomach problems" again i sat there looking at her blankly not giving her any info at all. She told me that she wanted me to get a certain book & to read it from cover to cover. This would then fix my stomach problems. I thanked her & ran off to get myself a stiff drink lol. Yesterday, Feeling intrigued about this book, i took myself on a trip to the libary & bought the book home. On reading the back cover of this book, the first four lines tell you that the author is a healer, that by using the process of thought, has cured herself of the very same "Stomach problems" that i have lol. There is no way that this woman could have known most of the things she told me about myself, nor could she have been tipped off by anyone because she told me things that only i know! Has any of you had an experience like this? i'd love to hear your stories if you have. 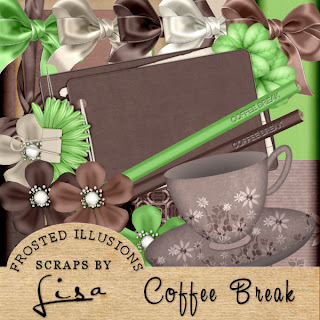 New PTU kit "Mr Frosty"
Stu has written this fantastic tut, using my Coffee Break Kit. 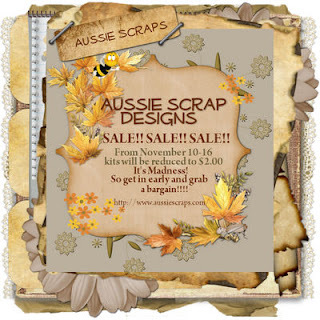 It's sale time over at Aussie scraps, click on the banner, get over there & bag yourself a bargain!! I thought i would share with you the recipt i got back from the Cancer Research Charity. On conversion $100 usd amounts to £65 Uk pounds, thats why it says £65 lol. If you click the picture you get a bigger readable view. 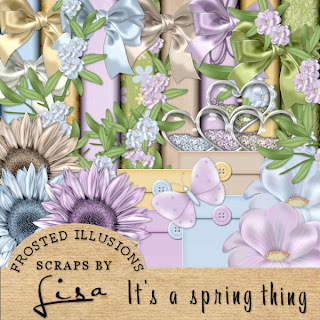 Aussie Scraps Novemeber Collab Kit!!! WOW are you seriously going to miss out on all this for just $5 yup just $5 get on over to Aussie Scraps now before you miss it!!! Coffee Break is up for $1 & It's A Spring Thing is priced at $1.25. The kits are still available as a whole, but now you can buy some of the parts seperately too. Wow thank you to all of you wonderful people that bought my "All Things Pink" kit for Breast Cancer Research. I've just been over to the stores to have a final add up & we managed to raise $75.50 USD Thank You!! I will personally on behalf of my family round that figure up to $100 USD & pay any of the Paypal charges that were made. So literally every cent you donated in buying the kits will go to Breast Cancer Research. Thank you each and everyone of you, you're wonderful people! Hopefully i'll get the money sent off to the charity at some point this afternoon, as soon as they aknowledge receipt of the donation, i'll post it up here so you can all see that your cash went to a wonderful cause. 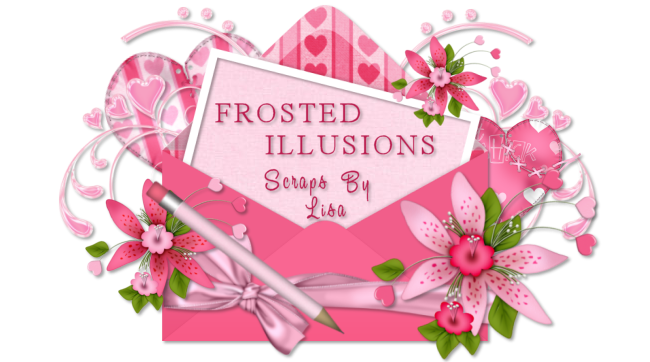 You can find it on Veronica's site HERE Go take a look its animated lovely. 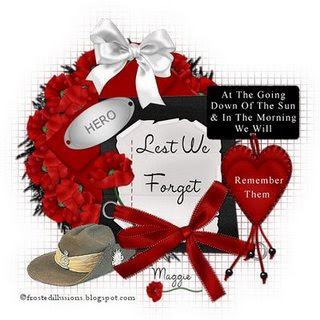 Maggie wrote this beautiful new tut using my freebie "Rememberance" kit. Sabrina has written this beautiful tutorial using my "Christmas Joy" kit, it's it just the cutest! i haven't deserted you all. I haven't been very well & spent a day or two in hospital, but i'm back from the dead now lol. 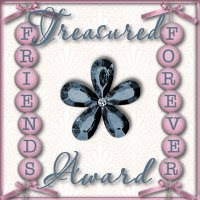 I know a lot of you have Emailed me, left me messages & awards etc. Thank you, i'm still pretty exhausted, but i promise i will answer every one of you in the next day or two. To my tut writers, i noticed a lot of emails from you all, i'll get back to each of you real soon, thank you.